We have established ourselves as a renowned organization engaged in offering a wide range kantha designer twin bed cover/gudari. Designed in compliance with the latest trends of the market, these bed cover are developed in tandem with the defined standards of quality. 1. Leading Manufacturer and Exporter from Jaipur, our product range includes Bedding such as Cotton Quilted Bedding set, Cotton Bedspread, Cotton Quilted Bedding, Bed Cover, Printed Bed Covers, Cotton Printed Kantha Bedspread and many more items. 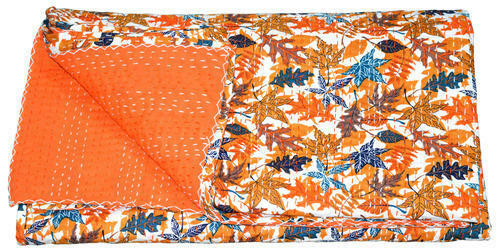 It is made from Jaipuri cotton fabric and adorn with handmade Katha work by our hard working team. We are manufacture suppliers and wholesaler of our cotton Kantha work bird print quilt and also cotton cushion covers, bedspreads. we are manufacture sappliers wholesaler and exports of handmade cotton kantha work bedspreads, cotton cushion covers, bedsheets, embroidered cushion covers, embroidered bedsheets. This is piece from our handmade cotton material. It is decorated with handmade beauteous katha work. 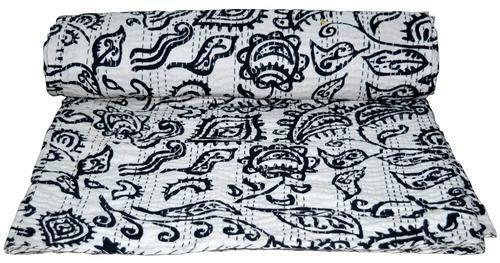 This attractive piece is made from Jaipuri cotton fabric. Looking for “Singal Bed Cover Gudari”?